Hello Signal Readers! It’s been a while, and I’m thrilled to be back here at The Library of Congress. Over the last eight months, I’ve been working to build up a new Digital Content Management Section (DCM), which will be supporting the amazing and talented librarians and allied professionals here by building capacity to acquire, preserve, and make digital content available for use by a wide range of audiences. What is the Digital Content Management Section? We’re glad you asked! 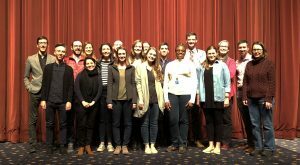 DCM is a brand new unit that brings together the five librarians that run the Library of Congress Web Archiving Program with 10 new Digital Collections Specialist Librarians who have come onboard in the last four months. We are functionally a digital start-up inside the world’s biggest library. But what does the Digital Content Management Section do? DCM was created to take responsibility for collecting and managing content for the Library’s collections in digital formats. Specifically it was set up; to codify and communicate digital content best practices; provide training to staff throughout the Library; and collaborate with IT staff working to build, maintain, and improve the Library’s technical capacity to collect, preserve, and deliver digital collections. A big (and particularly exciting) part of that work is supporting the Library’s digital collecting plan, Collecting Digital Content at the Library of Congress (PDF). That means our section is working to facilitate born digital acquisitions, maintaining custodial responsibility for digital general collections materials, conducting research and testing on digital content management methods and practices, and developing policy and procedures to support management of digital content for Library Services and the Law Library. I’m personally thrilled that we get to work across all these areas at once; we can make sure that our work to develop policy is very much grounded in our hands on work managing digital content. What have you been up to so far? As the team has come onboard over the last four months we have been getting up to speed on the various tools and services here, working on connecting with some of the many different groups working in these areas across the institution, and rolling up our sleeves and working with folks across the institution on some initial policy and guidance, digital acquisitions, and digital content management initiatives. Through all of that, I’m happy to report that it is indeed a really exciting time to be here. We are excited to be able to team up with LC Labs crew in helping run The Signal. I, and some of the new Digital Content Management colleagues are excited to join here as regular bloggers. That means that going forward you will keep getting updates on the exciting work Labs is supporting to enable new kinds of use of the digital collections, but you will now also be getting regular updates from us on some of the work we are getting into supporting digital content management across the Library of Congress. This is a syndicated post. Read the original at The Signal 2018-04-26.